Gothic Architecture developed out of Romanesque. 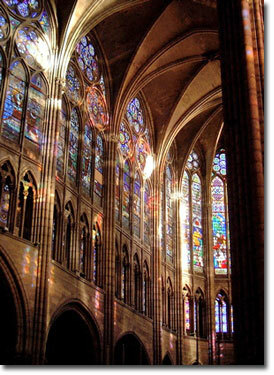 New developments in building techniques meant that Gothic churches could soar higher and become flooded with light. In comparison to the gloom and forbidding appearance of Romanesque Cathedrals and its sculpture the new Gothic style offered a vision of hope and salvation to the masses. The walls of these new buildings were not fortress like, they were full of glass – coloured glass. These buildings must have appeared truly miraculous, rising up to extraordinary heights. If the Romanesque sent out the message that hell and the devil was waiting the new Gothic message was of closeness to heaven and Gods glory. (E.H. Gombrich 1984). The pointed arch was an influence from the Middle-East. It produced less outward thrust than the rounded arch and therefore walls could be made thinner and more windows could be used. 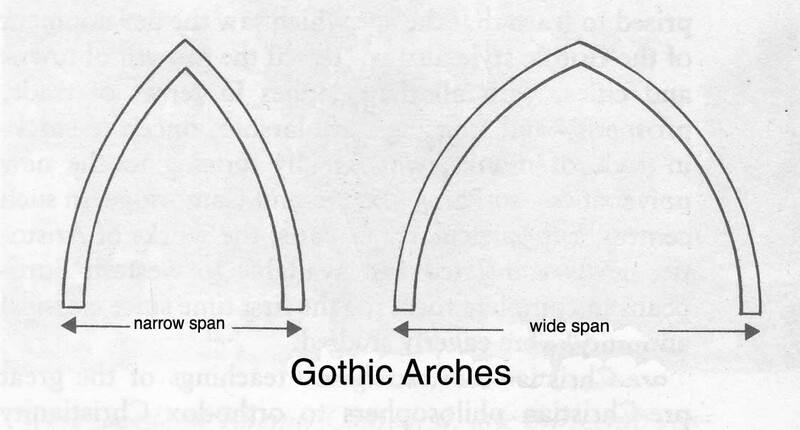 Another benefit was that the pointed arch could span a wider distance than a rounded one. This meant that windows could become bigger. It was discovered that if ribs ( a rib is an extra strip of stone ) were used to reinforce vaults then the wall between the ribs could be made much thinner than without ribs. This meant that ceilings and walls could become much thinner. 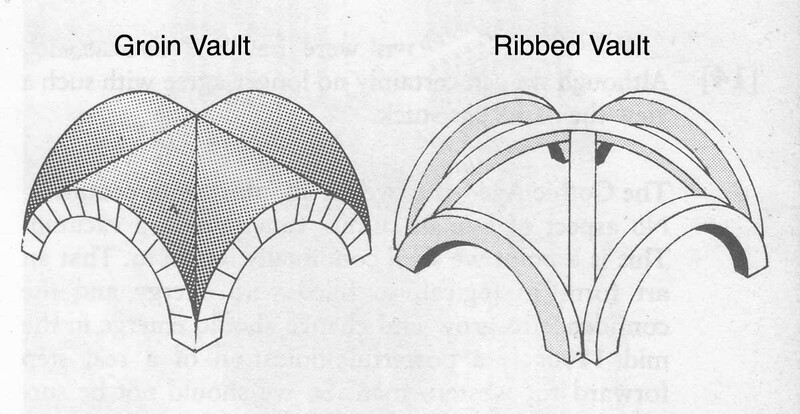 Ribbed Vault; Courtesy of Henry. J. Sharpe. Buttresses had been used during the Romanesque era to support walls ( A buttress is a structure projecting out from a wall which strenghtens it). A Flying buttress is a development on from this. It consists of two parts; a ‘buttress’ – which stands up straight and a ‘flyer’ which is an arch joining the buttress to the exterior wall of the church. 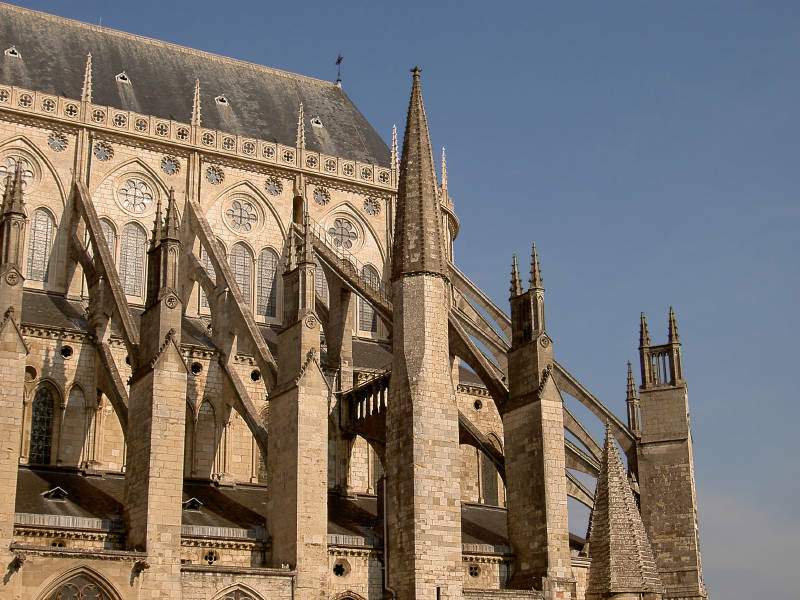 The development of Flying Buttresses meant that walls could be built much thinner and higher. 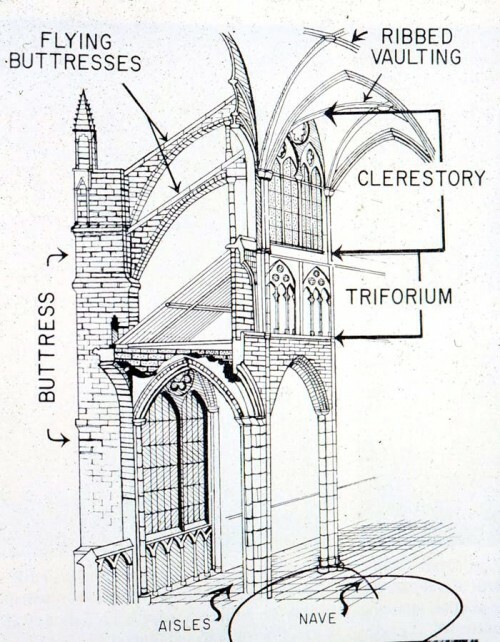 Flying Buttresses; Sainte Chapelle, Riom. 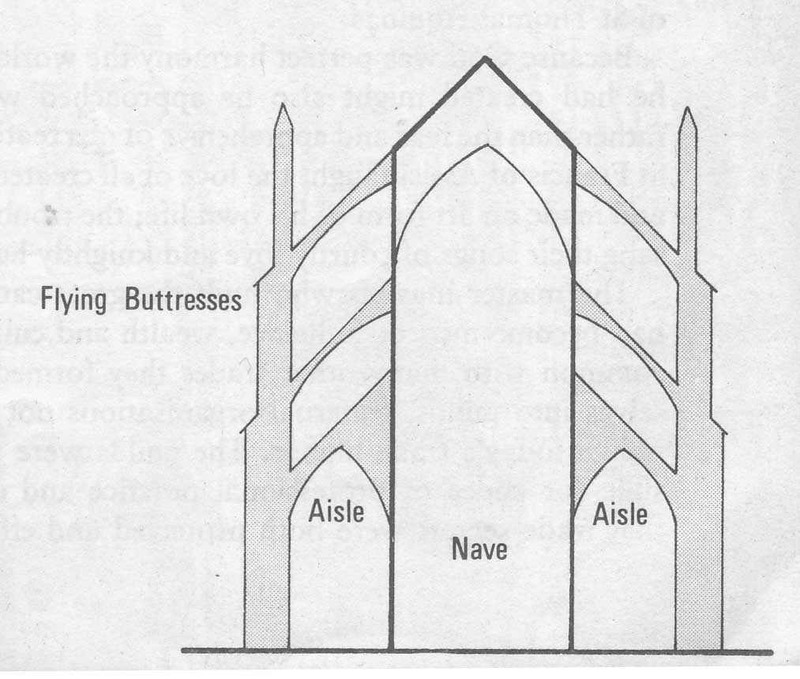 Flying Buttresses; Image courtesy of Henry.J.Sharpe. 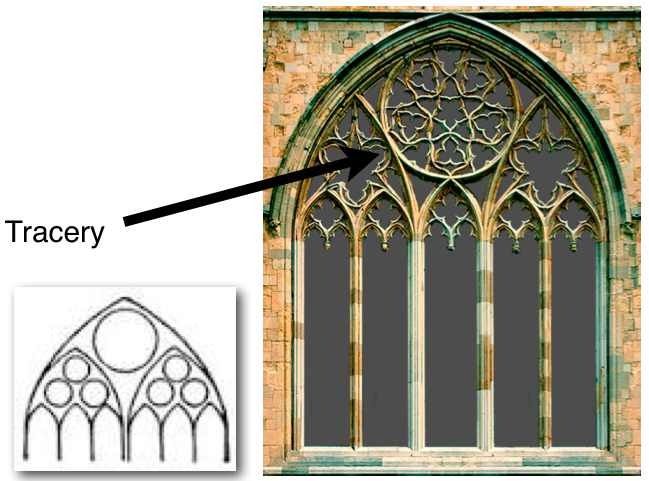 Gothic Tracery – Stone Tracery was used to make elaborate designs and patterns in windows. The function of tracery was to hold in panels of glass. Rose Window; Notre Dame, Paris. View of the exterior and the interior. 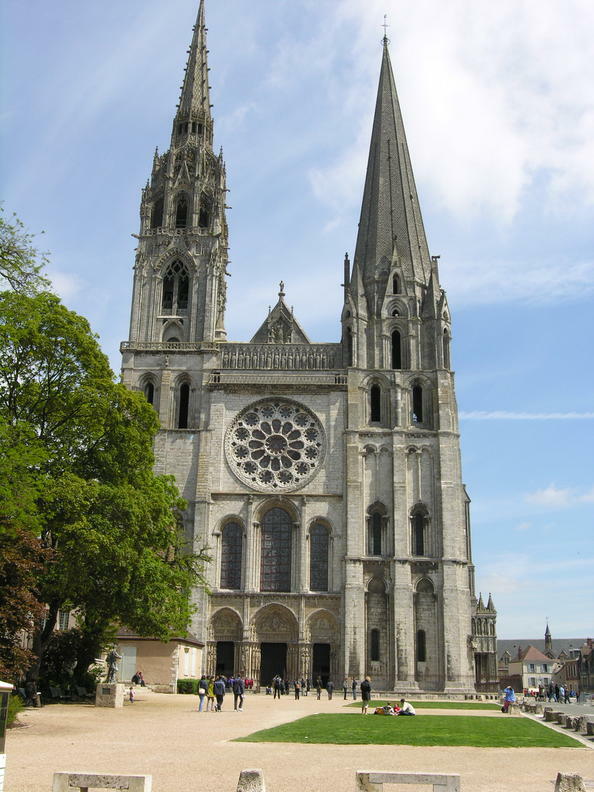 Chartres Cathedral and Notre Dame (Paris)are examples of Early Gothic style. 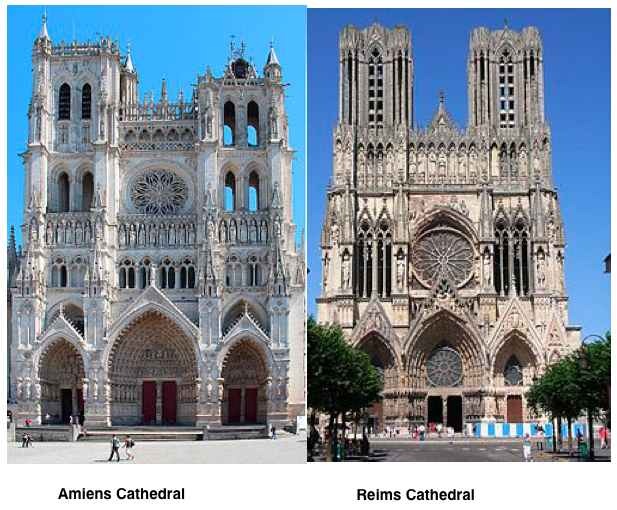 They are higher and lighter in appearance than the Romanesque style but they are not as heavily decorated as the later Gothic periods. 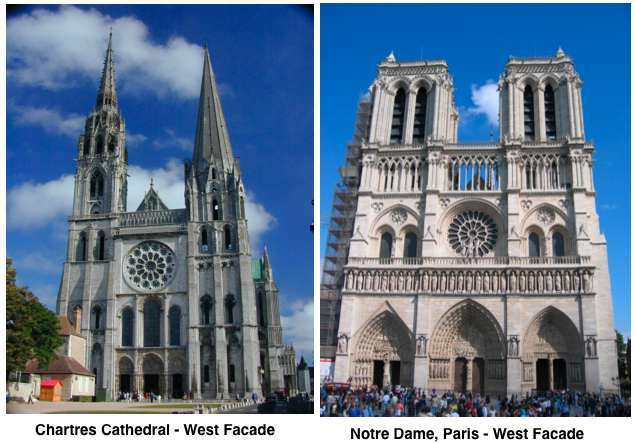 Look at Chartes Cathedral – the South tower on the right appears very plain compared to the North Tower( on the left) which was built some 300 years later in the late or “ Flamboyant “ Gothic Style. High Gothic Churches have massive deep portals (doorways) capped by pinnacles, with large Rose Windows and a great deal of decorated surfaces. There is very little area on the Church that is plain or undecorated. 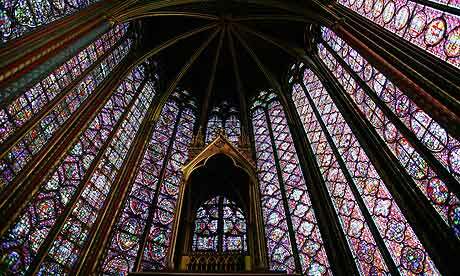 The Gothic tendency to lighten structure and add decoration was taken to extremes during the Late Gothic period. 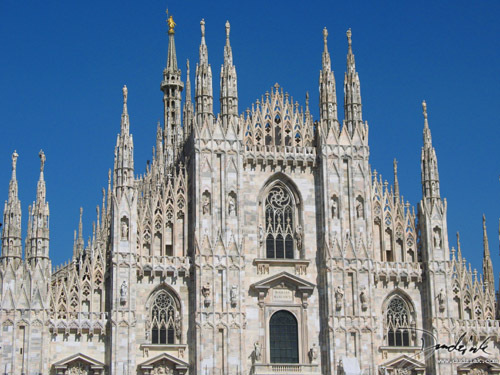 The facade of these churches took on “ an organic, encrusted appearance” ( O’Sullivan ). 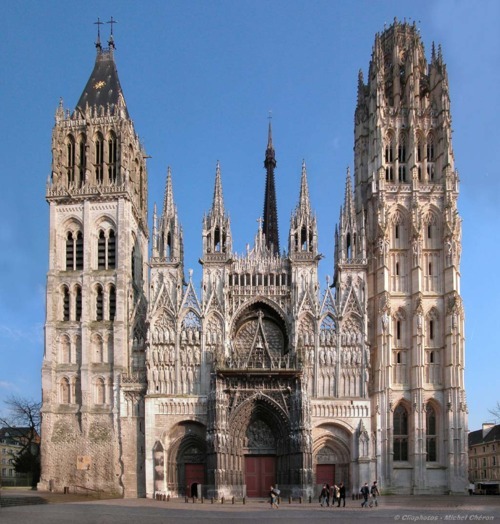 There is almost no space that is plain or undecorated.Rouen Cathedral and Milan Cathedral are good examples of the Late/Flamboyant Gothic Style. 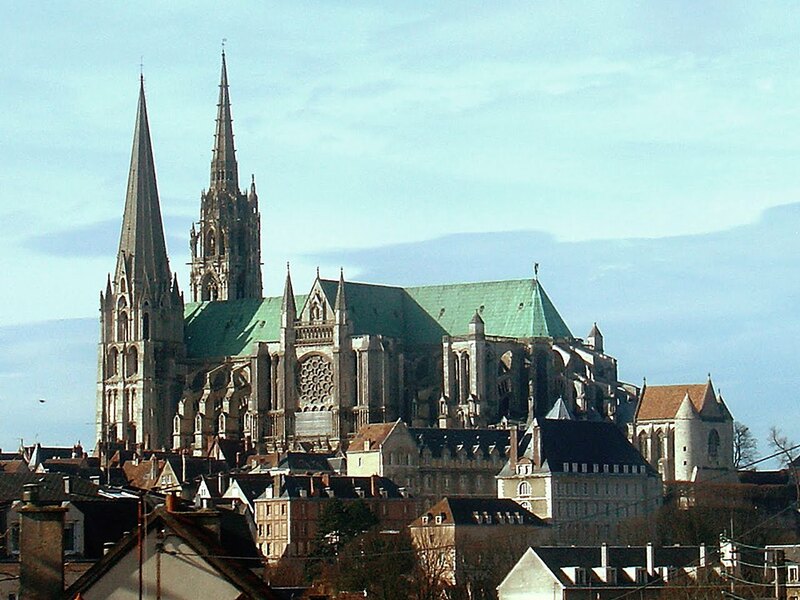 Chartres is considered to be one of the finest examples of Gothic architecture and is an UNESCO World Heritage Site. Building first started in 1145. After a fire in 1194 the Cathedral was reconstructed over a 26 year period. The North Tower was rebuilt the 16th Century after a lightening strike destroyed the original tower. The Cathedral is in a cruciform shape. 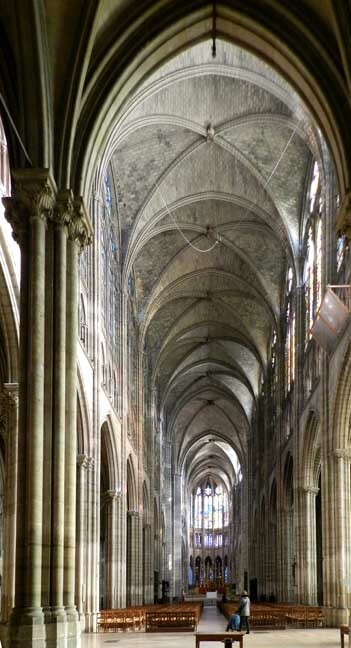 The interior of the Chartres cathedral is remarkable; the nave is wider than that of any other cathedral in France (52 feet, or 16 meters). 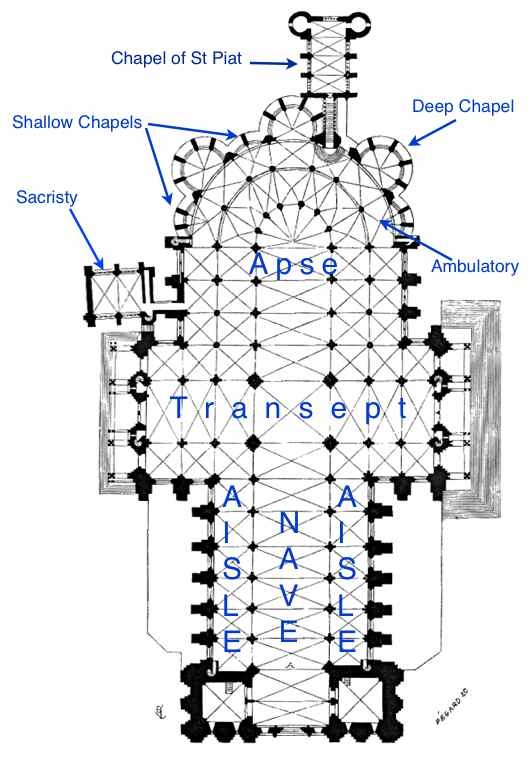 At the back of the Cathedrals apse is an ambulatory leading to a series of seven chapels – there are three deep rounded chapels and three shallow rounded chapels and one large rectangular chapel called the chapel of St Piat .